Rinpoche was given the Sanskrit name of Gyana Vajra (Tibetan: Yeshe Dorje), a practice that began with the birth of his noble father, His Holiness the 41st Sakya Trizin. At the age of four, Rinpoche began to read and write in Tibetan, and was remarkably proficient in his learning. Under the guidance of his noble father and of Venerable Lama Rinchen Sangpo, his early years were dedicated to the study of religious texts, reading, writing, grammar, memorisation of the main Sakya prayers and the performance of rituals. Throughout his life, Rinpoche has received from His Holiness the Sakya Trizin most of the major initiations, empowerments, oral transmissions, blessings and pith instructions that are inherent to the Sakya Tradition, notably the profound Lamdre teachings of ‘Taking the Result as the Path’. Furthermore, Rinpoche has received numerous common and uncommon teachings from some of the pre-eminent teachers of Tibetan Buddhism of our age, including His Holiness the XIVth Dalai Lama, the late H.E. Dorje Chang Chogye Trichen Rinpoche, H.E. Luding Khenchen Rinpoche, Khöndung Ratna Vajra Rinpoche, H.E. Luding Khen Rinpoche, H.E. Jetsun Chimey Luding Rinpoche, the late H.E. Deshung Rinpoche and the late H.E. Khenchen Appey Rinpoche. Khöndung Gyana Vajra Rinpoche currently resides at the Sakya Dolma Phodrang in Rajpur, India. Along with his noble father His Holiness the Sakya Trizin and his elder brother Khöndung Ratna Vajra Rinpoche, he engages in the holy Dharma activities that are held on a regular basis at the Sakya Centre for the benefit of all beings. As Vice-President of the Sakya Centre, he assumes its administrative responsibilities and goes to great lengths to ensure that the well-being and educational needs of its resident monks are fully taken care of. 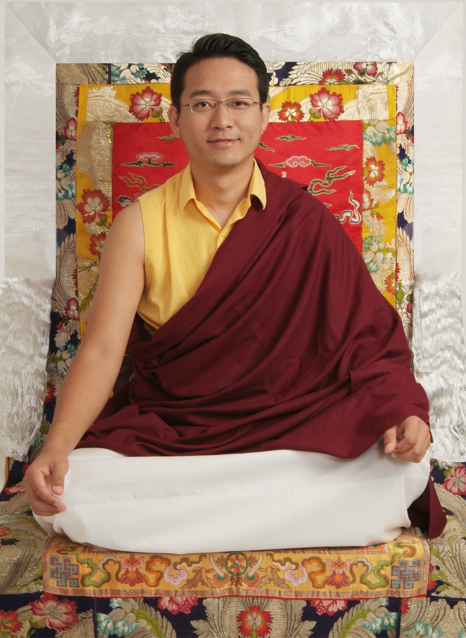 Rinpoche has, for several years, assisted His Holiness the Sakya Trizin during his noble father’s teaching tours both in India and abroad, while he himself has regularly turned the wheel of Dharma in centres across the world, giving teachings and initiations to disciples in the Americas, Europe, Asia and Australia. Rinpoche is fluent in English, Tibetan and Hindi. On the 24th of February 2008, Rinpoche married Her Eminence Dagmo Sonam Palkyi, herself descended from a noble Lama lineage family. Born and raised in Switzerland, Dagmo Kushok displayed from a tender age an unusual fervour for the Dharma. Today, she puts her remarkable voice to its service, expressing through music the Buddhist values of loving kindness and compassion. Rinpoche and Dagmo Kushok have two children, Khöndung Siddharth Vajra Rinpoche, born on 19th March 2014 and Her Eminence Jetsunma Ngawang Tsejin Lhamo Sakya, born on 2nd April 2011. Both children are endowed with extraordinary qualities. Having fully realised the Buddha’s teachings, both sutric and tantric, Rinpoche personifies kindness and compassion. Combining ancient wisdom and contemporary knowledge, his unique teaching style is direct, profound, and relevant to our everyday reality, as complex Buddhist concepts are made accessible through examples that all students can easily relate to. Rinpoche chooses to guide his students along the Dharma path as a friend, while his openness and sense of humour bring joy to all who come into his presence.